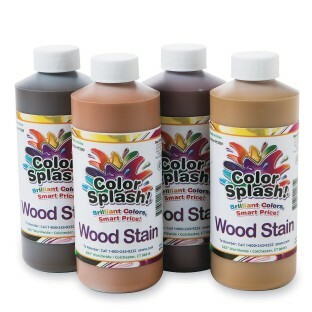 Color Splash!® Gel-Based Wood Stain, 16 oz. Perfect for all wooden craft projects. Non-toxic gel formula provides better application control. 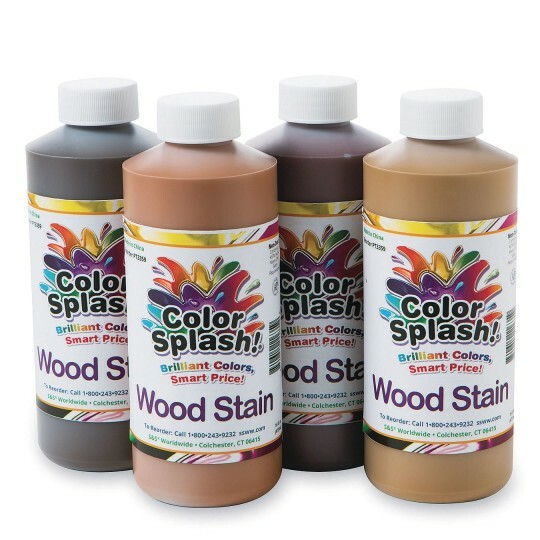 Perfect for all of your wooden craft projects, these stains provide a protective and decorative finish and can be used for staining and antiquing. Simply apply stain with a brush or soft cloth and gently rub the color into the wood. Use the clear gel formula for a translucent glaze or mix with another gel stain to create a custom color. Easy soap and water cleanup. Set of 4 assorted 16-oz. screw-top plastic bottles, with usage directions clearly marked on the label. Colors include maple, cherry, walnut and oak. Good value but can be improved. Good value safe for kids washes well nice colors but goes on like thick paint. I added liquid starch to the wood stain to thin it out so that the wood grain would show through the stain. This helped stretch out our stain supply and it helped it look more like authentic wood stain.